A few weeks ago I decided to sell part ownership of my car to Miss FFBF. She has since sold her car, and we’re now officially a one car household. I’m now into week 3 of commuting to work on my bike, so “how’s it all going you ask?” well I have to say that I bloody love it! Commuting to work on a bike is so much more than I was expecting it to be. It’s much more efficient than walking, it’s a slightly better workout than walking as I always end up out of breath when I get to my destination, and it’s more fun. I love zipping around on a bike, it makes me feel like 12 again. My boundless enthusiasm and positivity towards cycling has rubbed off on Miss FFBF. She has a bike which has been rarely used up until this point. She suggested going for a ride and a picnic together on the weekend. I was very excited, and of course agreed to it. As a side note it’s worth mentioning that Miss FFBF isn’t too big into exercise, unlike me. I LOVE working out and always have done. I look forward to doing it, I enjoy the process and thrive off the satisfaction from finishing it. Miss FFBF on the other-hand see’s it as boring. Last year I started going to Crossfit classes, which were fantastic and I would recommend it to everyone. However, I had to drive 45 mins to get to my closest Gym. The Membership itself isn’t the cheapest either, so unfortunately I made the decision early this year to cancel my membership solely due to the cost. Miss FFBF joined me for these classes and got a real kick out of the social interaction at a Crossfit Box (gym). She was more motivated to exercise than I have ever seen her before because she had the support of everyone else and we made some great friends during our short time there. When I stopped going, so did she, and has since done very little in the way of exercise. I just want to point out, she’s in fantastic shape, and as a nurse and a general workaholic she never sits still at home. She might not exercise, but she’s far from lazy. She’s constantly on the go at home doing little jobs here and there. I think this is great, but I believe our body is designed to run, push, and pull things and has a massive capacity to do physical activity. If we choose not to use it, we will slowly lose the power to do all of these things and before you know it, you’re ageing. OK, that was a large sidenote, but I think it helps to understand that Miss FFBF does not tend to suggest exercise to me, so I was REALLY excited. 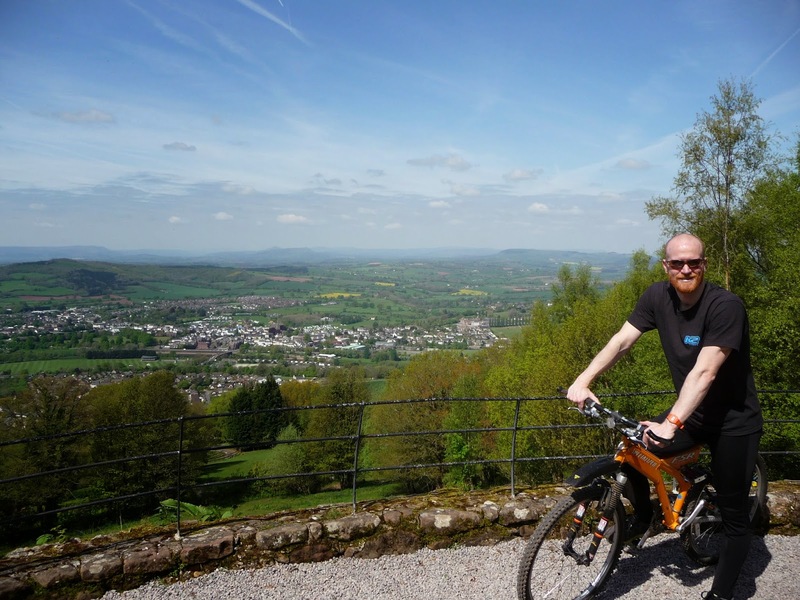 The plan was to go to a local tourist spot ‘The Kymin’ in Monmouth, have a picnic break there, cycle down to Monmouth, and then take a ‘back road’ to Symonds Yat. When we plan days out in the car, we try to go somewhere we’ve never been before and explore the area. We find this mini-exploration exciting. For our weekend bike ride, we wanted to keep the same philosophy and explore some local spots we’ve never been to before. The picture above is the view from the Kymin overlooking the beautiful town of Monmouth. We had a lovely homemade picnic of sandwiches, a flask of tea and homemade cake……. it was awesome! The weather, as you can see, was fantastic all day too. I think it was in the high teens all day. After our frugal lunch stop, we made our way down to Monmouth. It was all downhill, which was a lot of fun, and there were some roadworks on the main road down to Monmouth. There were LOADS of cars backed up the hill, with their windows open, engines running and with their understandably impatient looks. Confession time……….. I felt really smug! We then went on a back road (so we thought), to Symonds Yat. After a few minutes the road turned to country path. It runs alongside the River Wye all the way to Symonds Yat and is simply stunning. The route is called the ‘Periguin Path’. 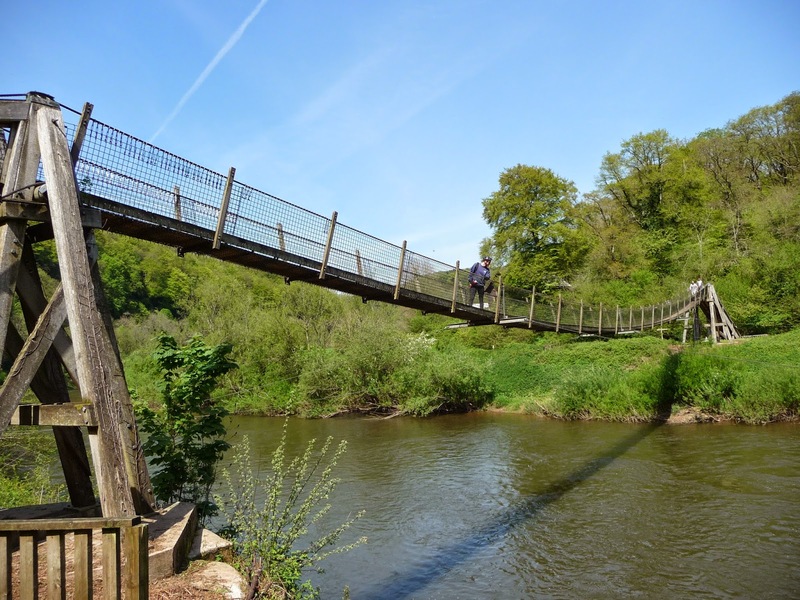 When we approached Symonds Yat we came across a very cool bridge – Biblins Bridge. I had the do the obligatory walk over, and bounce half way down, all with a stupid look on my face. Miss FFBF took a picture of me below. Then we finished off our ride by cycling home from Symonds Yat. The whole ride took 4 hours, we weren’t cycling the whole time, as we took a couple of breaks. We had a fantastic day! We explored some local areas we had never been to before (but had been meaning to visit for some time), we burned a shed load of calories, we enjoyed the beautiful countryside with some stunning views, we spent next to nothing (homemade picnic), and we came home feeling great. What a wonderful way to spend a day! I’m thoroughly enjoying life on a bike, and we intend to have many more days like this. we’re talking about biking holidays across the UK, France and Italy. We could both imagine doing this in our spare time when we retire (in about 10 years). I thought it would be nice to share my experience with some of you readers to see if this type of day would appeal to you too. I would highly recommend it to everyone. I’m quite new to this Blogging game, but I was thinking that when I get enough readers, maybe we could set up a ‘Frugal Bike day’ somewhere in the UK. We could all meet up, talk about our goals, support/motivate each other, go for a bike ride somewhere, grab a bite to eat and chill out in the afternoon/evening (followed by a few drinks perhaps!). A day to make new friends, enjoy each others company, save money or talk about it, exercise and enjoy the countryside/nature etc. I’m not sure if this of any interest to anyone, what do you think? If there’s enough interest right now then let’s go for it now, but I understand that my readers are few and far between and fairly spread out over the world. I’m based in South Herefordshire, England, so if if sounds like fun to you, drop me a line. I hope you all had a great Bank Holiday weekend. Thanks again for reading! Are you into cycling too? Does any of this sound appealing to you? I'm pleased to hear that you enjoyed reading my blog today. That means a lot to me! Cycling certainly is popular among the FI community. Transport is one of the three biggest expenses we have in our modern world. Cycling offers a much cheaper alternative to travel and it's a lot of fun! It keeps you fit, and there's something very exhilarating about riding around with the elements. I really like the idea of cycle touring and I could imagine myself and Miss FFBF doing more of it in the future. Thank you for sharing your thoughts, and please don't worry the spelling mistakes. It happens all the time and I know what you meant anyway.